Palmitic acid is a saturated fatty acid found above all in palm oil and other derivatives -mainly in palm stearin- and it is always accompanied by other unsaturated fatty acids. Such acids respond to the formula C16H32O2, corresponding to the mono carboxylic saturated acid of straight-chain with 16 carbon atoms. It is available in different purities together with stearic acid if it is fully hydrogenated, or with other unsaturated fatty acids if it is only partially hydrogenated. Depending on its use and necessity, a method will be formulated. Palmitic acid comes from a vegetable origin and it is primarily obtained by the hydrolysis of palm oil (or its fractions as stearin), followed by total or partial hydrogenation and subsequent distillation. Purities of 45 -65% palmitic are obtained. This is an acid with multiple uses in different industries and markets. Depending on its use one process or another will be considered for its optimum finish. Palmitic acid is a solid at room temperature, white with a slight yellowish hue, almost odorless. Its freezing point is between 45º-55º depending on its stearic acid content and degree of hydrogenation. Its main applications are feedstock in the production of all kinds soaps, cosmetics, detergents, metal soaps, mold inhibitors or for the production of esters, among many other possibilities. 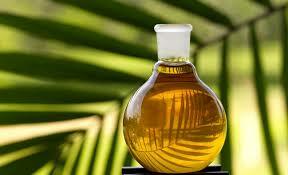 Palmitic acid is one of the highest rated oleochemicals due to its multiple uses and benefits. It helps ecology and therefore it is a quite efficient resource in contrast with chemicals that are more aggressive and carry more consequences. In Cailà & Parés we take care into the develop and extraction of these oils for different markets to constitute a resource for the development of different products and goods. In recent years we can assure a growth in oleochemicals demand in contrast with chemicals, since they have more advantages than the latter. Its main properties attest the strength and effectiveness through various commercial finishes to achieve profitable and effective products for different consumers. Its different applications are a clear example of the excellent properties that this acid possesses thus ensuring maximum satisfaction and quality. These two products can be found in packaged flakes or in 25 kg. bags, in 500 kg. or 1000 kg. bags. It can be also marketed in bulk tankers. Presented in 180 Kg. drums., tank or bulk.